Arab father and son arrested after explosives, rifles and ammo unearthed in their home adjacent to Jerusalem District Court. 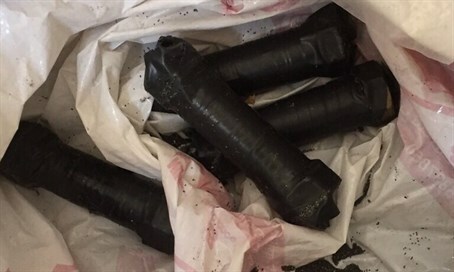 Two Arab terrorists, father and son, were arrested on Tuesday afternoon after explosives and weapons were discovered in their home in Jerusalem. Their home is located adjacent to the Jerusalem District Court on Salah al-Din Road not far from Hebrew University's Mount Scopus Campus; just last Monday a firebomb was thrown at the court in an attempt to burn it down. Police detectives searched the home aided by Border Patrol officers and a canine unit, and found hidden in the house explosives, improvised rifles and ammunition. With the help of the trained dog the detectives located the weapons, and a bomb squad then neutralized the explosives at the scene. Both the father and the son were arrested, and an investigation was launched against them. Police released in a statement that they are "working at all times to thwart incidents endangering human life, on all fronts, and continuing activities and increased deployment throughout Jerusalem for the peace and security of residents of the city and its visitors."